A multidisciplinary and duo of scientists have analyzed the Codex Vergara. 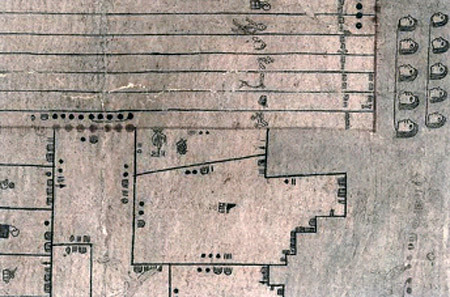 The Codex Vergara is a 660 year old document made by Aztec surveyors used to measure the surface of a field. It contains schematic drawings and measurements of individual fields. They were able to figure out that that Aztec surveyors probably used several types of algorithms to calculate area. There’s no doubt that they calculated areas by multiplying length by width. But when these people were confronted with irregular four-sided lots, they came up a different approach from what we’re used too, such as multiplying the average of two opposite sides by an adjacent side. The research has been published in yesterday’s issue of Science under the title, “Aztec Arithmetic Revisited: Land-Area Algorithms and Acolhua Congruence Arithmetic.” The authors of this study were also able to figure out that when a measurement did not match their standard units for distance, a “land rod” or about 2.5 meters, they added symbols, such as an arrow, a heart, a hand, or a bone, to indicate the deviation. Each of these symbols corresponded to different fractions of a land rod. I thought the Aztec number system was decoded a while ago. I knew they Aztec used a vigesimal system, where the number 20 was its base. That differs from modern day decimal based systems. Furthermore, in Aztec arithmetic, a dot equals 1, a bar represents 5, and there are other symbols for 20 and various multiples thereof…. but we didn’t know if the Aztec figured out fractions of a whole number. I guess now we do. To denote half the Aztec basic unit of measure—known by Aztec experts as tlalquahuitl or land rods—the surveyors used an arrow symbol. So for a field that measured 20 land rods by 10 land rods plus an arrow (or 20 multiplied by 10.5), the correct area was 210. “Two arrows is one unit, five hearts is two units, five hands is three units,” del Carmen Jorge y Jorge notes.